My great grandfather, John Patrick O'Hara, was born in Ireland. He was a Major in an Irish Regiment that was garrisoned in Ceylon (Sri Lanka) when occupied by the British, just after the take over from the Dutch. He married Mary Ann Duffy daughter of a fellow officer in 1830 in Ceylon. I found this picture in my files and am sure it will be of interest to kindred researchers. 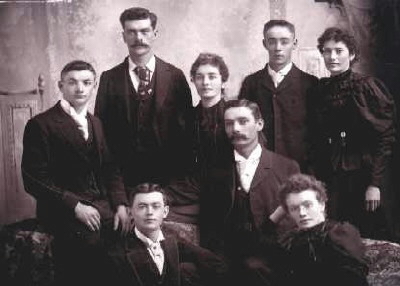 Back row: Steve O’Hara, Annie Dermady, Jack O’Hara and Jane O’Hara. Time and place are unknown but my guess is turn of the century, in Westport, Ontario, Canada. I'm a descendant of Bernard O'Hara born about 1791 & Elizabeth McConnell born about 1807. Arrived in Canada in 1839 & settled in Newton Robinson (near Alliston) Ontario. Please write if you might be a distant cousin. I am looking for any information on Michael O'Hara born 1785 in Enniskillen, married Molly Bond born about1800, married about 1825. They had a son Thomas born 30 Oct. 1829 in Ross Township, Renfrew, Canada. Thomas married Maria McDonnell and had 12 children. I have information on and after Thomas but am trying to find the roots in Ireland. I would like to contact Cheryl Judge re The Life & Times of James OHara (c. 1808-1865).